There are four closely related breeds of Belgian Shepherd collectively referred to as ‘Chien de Berger Belge’, which were classified as independent breeds in 1891. 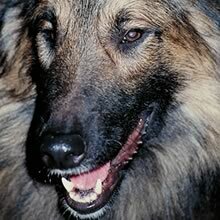 All are herding and guard dogs, and are primarily distinguished by their appearances: the Malinois has short hair, the Laekenois (not currently recognized by the American Kennel Club) has wiry hair, the Groenendael (also known simply as the ‘Belgian Shepherd’) has long, black hair, and the Tervuren has long hair of any other color. The Tervuren was named after the Belgian city of Tervuren where it was developed. It was recognized by the American Kennel Club in 1918, but nearly went extinct before World War II. Recently, it has enjoyed moderate popularity as a versatile breed and excellent herder. The Belgian Tervuren has a shoulder height of 58-64 cm (23-25 in) and weighs 18-34 kg (40-75 lbs). It has a flat skull, almond shaped eyes, a moderate stop (point at which the muzzle meets the forehead) and triangular, erect ears. Belgian Tervurens have a flat back, curved tail, and small, round ‘cat feet’. They are muscular and lithe with square-proportioned bodies. The Belgian Tervuren has a long, thick double coat, which comes in brown with possible black overlay (which may darken with age) and a black mask. Chest and toes may contain small patches of white. The Belgian Tervuren may also be sable or grey, but this is penalized in the show ring in some countries. Belgian Tervurens shed heavily once or twice a year. The Belgian Tervuren is energetic, lively and eager to work. It is bred for intelligence and awareness of its surroundings. Belgian Tervurens require frequent face time and playtime with their master. They tend to bond very strongly with one person. Belgian Tervurens can develop phobias of certain objects or locations as puppies, but usually grow out of it by adulthood. The Belgian Tervuren is energetic, lively and eager to work. It is bred for intelligence and awareness of its surroundings. Belgian Tervurens require frequent face time and playtime with their master. They tend to bond very strongly with one person. Belgian Tervurens can develop phobias of certain objects or locations as puppies, but usually grow out of it by adulthood. The Belgian Tervuren should be socialized as a puppy if it is to live with other dogs or pets. It is shy around strangers, but gets along well with children. It has high socialization and activity requirements, making it less than ideal for those unwilling or unable to invest significant time. You can find Belgian Shepherd Tervuren puppies priced from $500 USD to $2500 USD with one of our credible breeders. Browse through our breeder's listings and find your perfect puppy at the perfect price. The Belgian Tervuren should be socialized as a puppy if it is to live with other dogs or pets. It is shy around strangers, but gets along well with children. It has high socialization and activity requirements, making it less than ideal for those unwilling or unable to invest significant time. Belgian Tervurens require brushing and combing twice weekly, more often when shedding. Excessive brushing or combing can damage the undercoat. Belgian Tervurens have a long life span of 11-13 years. Belgian Shepherds have similar health problems as other breeds, but are particularly susceptible to epileptic seizures, especially the Tervuren. The Belgian Tervuren should be trained gently, but with determination. Belgian Tervuren are highly adverse to harsh treatment; hitting or yelling at them will only have negative effects. Best results are achieved through awards-based training methods. Belgian Tervurens require mental stimulation, so training should not be overly repetitive. Obedience and sport-specific training (such as tracking or dog agility) will reap great benefits and allow the Belgian Tervuren to realize its full potential. The Belgian Tervuren needs a sufficient amount of outdoor exercise every day, including a long jog or walk and active playtime in the yard. Belgian Tervurens thrive on mental stimulation, and will enjoy a complex game or sports training session even more than a simple round of catch. Belgian Shepherd Tervuren Puppies for Sale - Shipped Worldwide! Finding the right Belgian Shepherd Tervuren puppy can be dog gone hard work. PuppyFind® provides a convenient and efficient means of selecting and purchasing the perfect Belgian Shepherd Tervuren puppy (or Belgian Shepherd Tervuren puppies) from the comfort of your home, 24 hours a day, 7 days a week. Take advantage of our PuppySearch or leisurely browse our directory of hundreds of dog breeds, Belgian Shepherd Tervuren dog breeders, Belgian Shepherd Tervuren dogs for adoption, and Belgian Shepherd Tervuren puppy for sale listings with photos and detailed descriptions. Some Belgian Shepherd Tervuren puppies for sale may be shipped Worldwide and include crate and veterinarian checkup. Many Belgian Shepherd Tervuren dog breeders with puppies for sale also offer a health guarantee. With thousands of Belgian Shepherd Tervuren puppies for sale and hundreds of Belgian Shepherd Tervuren dog breeders, you're sure to find the perfect Belgian Shepherd Tervuren puppy.